Good evening everyone! As promised and well overdue, here is the package of Shiitake Mushroom Mycelium (Spores) and subsequent additional kit / supplies to successfully grow my own Shiitake mushrooms at home on Logs. Originally, when I first heard about growing mushrooms on logs it honestly didn’t sound attractive! (I’m a renter, what if I had to move?, where do I put the logs?, what if they rot? etc.) That was before I discovered permaculture and how we do encourage growing perennial, continually fruiting vegetables and fruits etc. The Drill Bit and Depth Collar are the right size for the Mycelium Dowels, you just need to measure the length of the dowels and add 5mm to 1cm onto the end. and fit the depth collar tightening with an Allen Key (Hex Key). 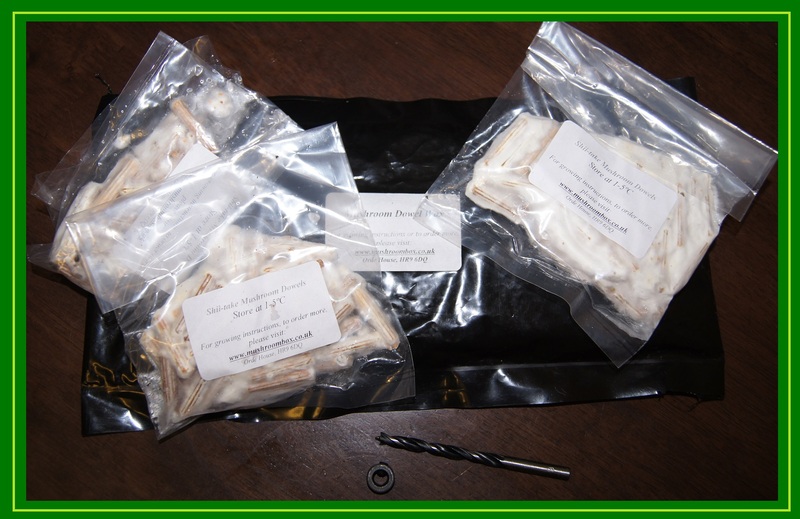 The Mycelium Dowels are the same as the little wooden Dowels that you use to piece together furniture from Ikea for example, they just have been sterilized and have been inoculated professionally with Mycelium.